Molly is a guest at the Phillip Island Enviro Resort. The resort is made up of a series of huts grouped together and accessed by brick paths. There is also a communal dining room next to a swimming pool equipped with toilets and changing rooms. The resort guests are given towels when using this pool. There are also 2 unpaved dirt paths leading down to a secluded rocky beach. The beach is also part of the resort and its brochures describe it as a perfect spot for sunbathing. Molly notices a deep rock pool there which can be reached by climbing over some rocks on the beach. She has seen people swimming in this rock pool.There is a large rock on the edge of the rock pool that looks perfect for diving.Molly decides to dive from the rock but hits her head on a submerged rock on the edge of the pool that she didn’t notice.She suffers severe head and spine injuries.Evidence shows that the resort staff are trained to advise any clients who want to swim at the beach that the rock pool is not safe for swimming or diving, but Molly did not ask anyone before she went to the beach.There are no signs anywhere on the resort warning of any danger. 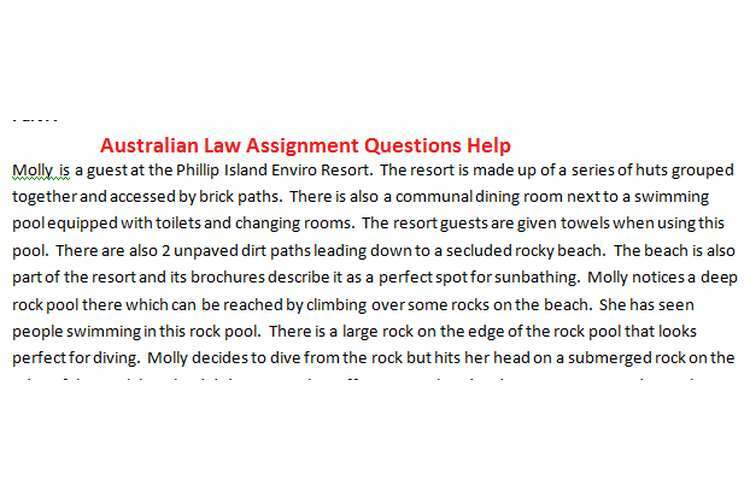 Advise Molly whether she could sue the Phillip Island Enviro resort. What defences could be raised by the resort? Are the outcomes the same under the Wrongs Act (Vic) as they would be under the common law? Assume that Molly does not dive in the rock pool but slips on bees wax accidentally spilled on the rocks by Paul the maintenance worker employed by the resort while performing his duties. Contrary to Resort policy and his Manager's instructions Paul did not rope off the area and immediately clean up the spill. Is Paul liable for the Molly's injury? Can Molly sue anyone else?